When you are worried about doing your makeup and being able to see yourself up close and personal, one of the best things that you can reach for is a double sided makeup mirror. Sure, you could lean over your sink and try to balance yourself while tweezing. If you’re lucky, you’ll not pinch yourself or grab too many hairs while you’re there. Rather, with a tabletop / portable or a wall-mounted double sided mirror can help you be both comfortable, while giving your face the attention that it needs. Now, with that being said, there are a large number of these kinds of mirrors on the market. We have found a couple of your, so that you can make your selection of which is right for you. 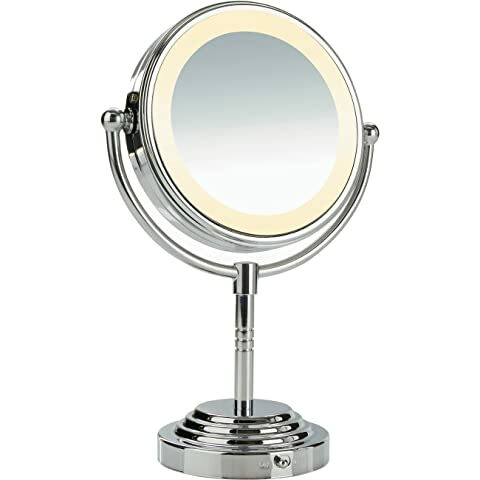 The simple design of this Conair makeup mirror is one of the most attractive features. It has a classic feel, with a solid base and a swivel coin mirror in the center that you can turn back and forth to get alternating magnifications with. With a clean polished chrome look, this is an ideal choice for men or women. This model comes with magnification (5x on one side and 1x on the other), lighting around the outsider of the mirror and operates on two AA batteries. No need to plug in, just turn it on and get your face done. Additionally, this is a handy double sided mirror option because it is fog free, so you can still use it while drying off in the shower, even if the room is all steamy. This metal mirror is made from brass in a cool looking contemporary style. Mounted on the wall, it can complement most bathroom decor. As a bonus, like its name suggests, it is wall-mountable. The swivel arm allows for reach (extending out to a maximum of 16.5 inches), making it an ideal choice for use by more than one person. While you only get one side of 3x magnification with this double sided beauty mirror, it is still a great choice for day to day use. It offers a smallish viewing area, but the 8 inch diameter is more than enough for you to put on makeup or anything else that you may need it for. The style is contemporary, with a tripod stand that is more sturdy than traditional models. One of the nicest things about this model is that you can take it off of the base and it has a hook on it as well, so that you can hang it if you want to. Additionally, you can also use it as a handheld mirror. 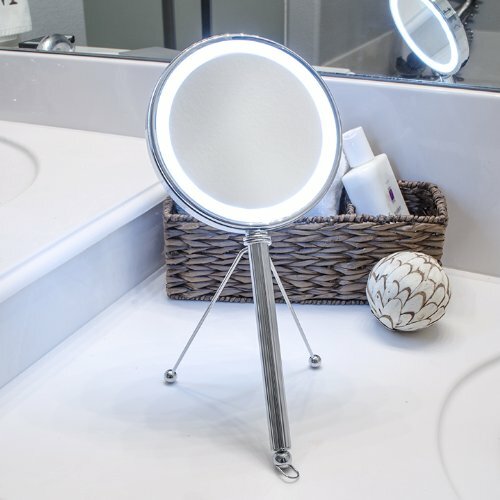 We figured you would love the options, and thus would recommend this double sided makeup mirror for those that need something that is multi-functional or with limited space to do make up. 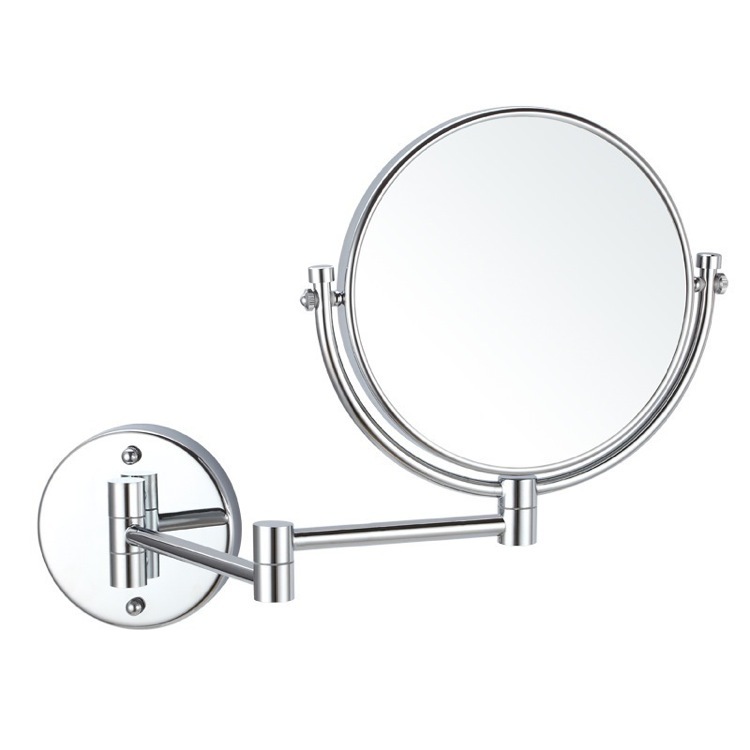 This 6″ Chrome Double Sided Mirror offers two sides of magnification with near normal 1x mag on one side and 5x on the other. The Pure Enhancement LED model gives you bright light, helping to ensure that you can see every hair or wrinkle, whether you want to see them or not. This is an ideal choice for tweezing or detailed makeup though, for that reason.